Home » H.A. Kidd knitting supplies » 2 Ways to knit a hat in the round, which is better? 2 Ways to knit a hat in the round, which is better? Have you ever knitted a project “in the round” before? If you haven’t, a whole world of new projects and tools await you. Many knitters start off working “flat” projects because it’s an easy way to make a plain scarf or small blanket, which make nice first projects. However, knitting a hat in the round is also a great project for new knitters. They are small and quick to finish, and also make easy gifts. There are more than 2 ways to knit a hat in the round, but here are the two more common ones. This week we’re knitting up some Top This hats (one in pink, and one in green) to demonstrate a few techniques and tips for knitting in the round. Knitting in the round requires either circular needles or double-pointed needles. 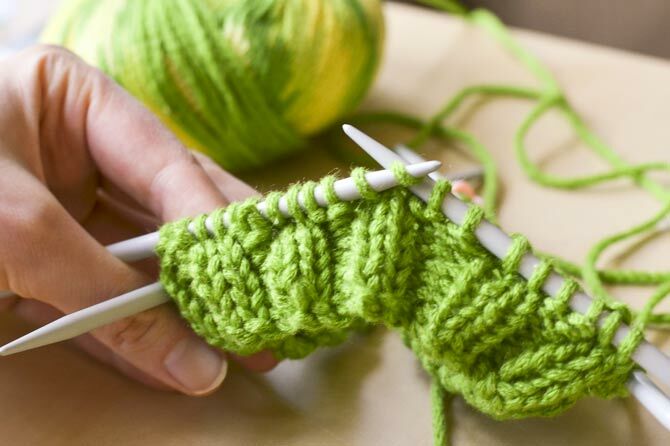 Here are a few tips to keep in mind when knitting in the round. 2. A common reminder is to “join to work in the round, being careful not to twist“. This means to make sure that the cast on row is fully lined up below the needle (as shown below), rather than twisted around the needle (almost like a mobius strip). When you are knitting flat, you don’t need to worry about this step, but it is very important when knitting in the round. 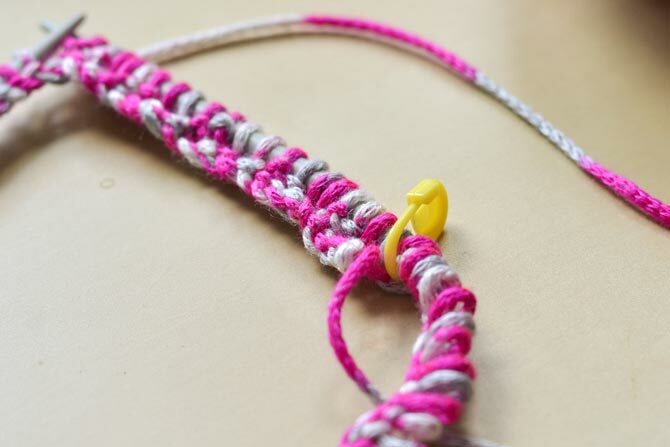 Use a stitch marker to mark the beginning of the round. 3. Remember to use a stitch marker to mark the beginning of your round. Knitting pattern instructions will often indicate this directly as “place marker” or “pm” as an abbreviation. Keep different colors of stitch markers on hand for different uses in the pattern. 4. 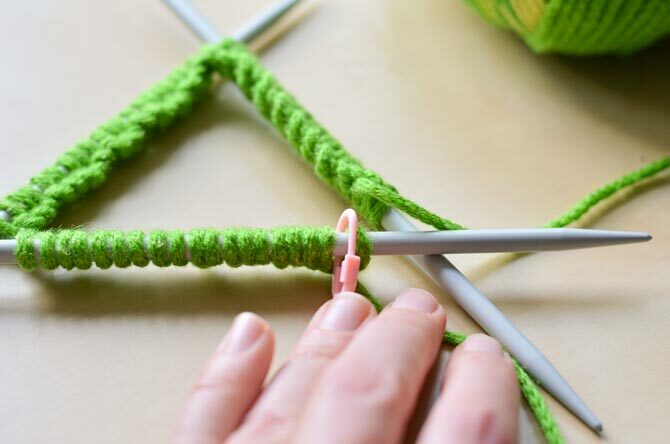 If you’re knitting with double-pointed needles, like I’m using for the green hat, you can’t place a marker at the beginning of the round since the beginning of the round starts in between two of the needles. 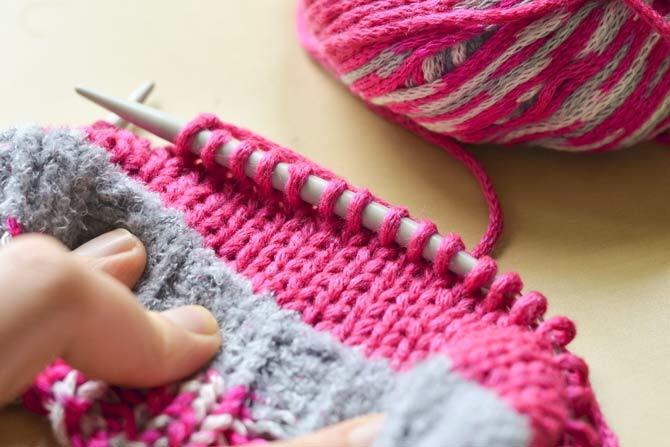 Instead, place it after the first stitch in the round (as below), or, clip it to the knitted fabric itself and adjust its place ever so often as you knit more of the project. With double-pointed needles, place the marker after the first stitch on the first needle, to mark the beginning of the round. 5. 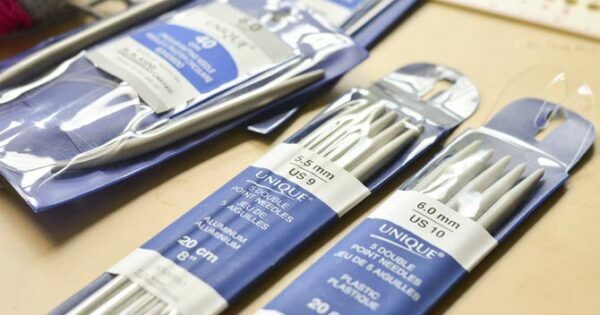 Double-pointed needles can feel awkward at the beginning, as though you’re holding too many things at once! But, remember that you’re only ever working with 2 of the needles at once, and there will be 2 (or 3) other needles at rest that are simply holding the rest of the stitches in the round. 6. 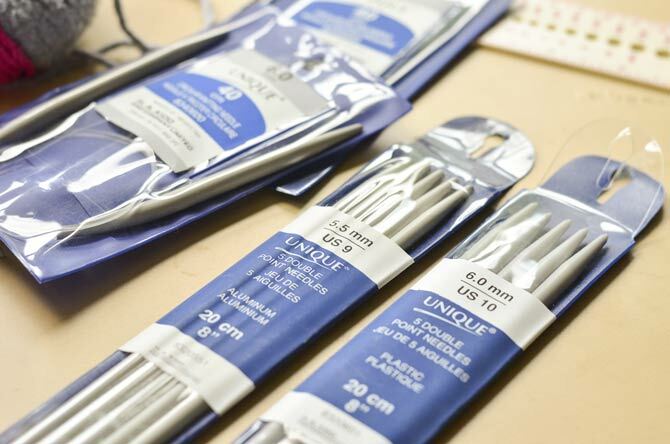 Try to keep things steady by resting your 2 working needles on top of the 2 resting needles on either side. After a while you’ll find yourself making this adjustment automatically whenever you move from one needle to the next. Double-pointed needles can take a bit of practice to get used to. 7. Most patterns will tell you to work the first few rounds (or rows, if working flat) in ribbing or another stitch that will let the edge lie evenly (instead of curling up on itself, like stockinette stitch tends to do), and then change to the pattern stitch for the rest of the project. In this case our pattern stitch is stockinette stitch (knitting every round), so we need to count the rounds of stockinette stitch to track our progress. You can use a row counter gadget to help count your rounds (or rows), by turning the dial each time you finish a round. If you’ve lost count and need to just count them visually, just remember that one of those little “V” shapes in the fabric is one stitch. By counting how many of those “Vs” are stacked on top of each other, you’ll get your count. Just remember to always include the round that is on your needle also. For example, in the picture below, we can count 6 rounds of the pink yarn have been knitted, plus the one on the needles so that actually means we have knitted 7 rounds of pink. Counting how many rounds you have knitted is easy to do on stockinette stitch. Knitting in the round can be great television knitting or “transit knitting” while on the go, especially if you’re using a circular needle and don’t ever have to worry about dropping a needle by accident. For these hats, we’ll knit several rounds of ribbing to start, then continue in stockinette until it’s time to work the decreases. We’ll get to the decreases in our post tomorrow! 2 Ways to knit a hat in the round, which is better according to you? I think knitting in the round with circular needles is better for me. I’ve tried to use double pointed needles and failed. I’d love to get better at using DPN’s so I can make socks but maybe some day. I’ll probably have to refer to YouTube or take a class. Hi Melissa! I find knitting in the round with circulars much better as well. You can knit socks in the round with circulars as well. You need a long circular to achieve this. We’ll have tutorials, but in the meantime, there’s a lot of information about this topic on YouTube.